Memorizing scripture is important to many families; It's actually one of my New Year's Resolutions for my family. Knowing scripture encourages us when we are down, helps us know right from wrong, make decisions, guide us, etc! It also helps us learn and know the Word of God! To help my 3rd grader memorize various Bible verses, I made some easy Scripture Memory Puzzles using foam. 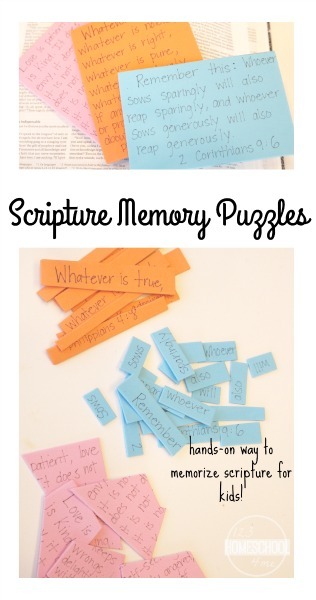 Visit 123Homeschool4Me to find out more about these Scripture Memory Puzzles.